This week we're talking about FFK on Monday, since I have a brand new design I'd like to share with you on 12/12/12! So, Wednesday, you'll be getting that surprise! Unity. 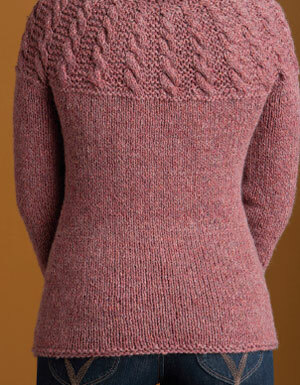 I know I've said this before, but this is another one of my favorite sweaters from Finish-Free Knits. This is one of the sweaters I'm eager to begin wearing myself. And, even though the sample is knit in the 34" size, and when I had tried it on with my 38" bust, it fit great with the negative ease! 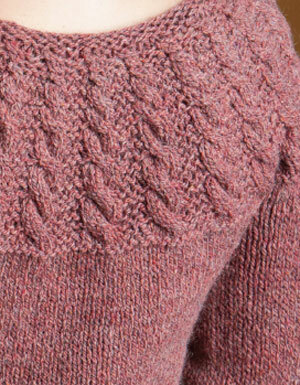 Worked from the neck down, this simple pullover is a great first-sweater project for cable-lovers. Stitches are increased over a handful of rows spaced throughout the yoke, then they are divided for the sleeves and body. While the body has some basic waist shaping, the sleeves are worked straight to the cuff. Not only a quick-knit, this sweater is super warm. The joy of top-down knitting is that it can be tried on as it's being knit! The best place, in my opinion, to try it on would be just after the body and sleeves have been divided, and after working a few rounds of the body. Here you can get a good idea of how it will fit around the bust and upper arms, then adjust accordingly (if necessary). So, I was sure to add a little tip section into the book with this pattern explaining how to customize a top-down yoke sweater. And, I really think this is a great design for that sort of experimentation—it's knit in a hefty yarn that works up quickly, so it won't be a headache to rip out a few rounds if it's not perfect the first time, and the sleeves and body are worked in Stockinette stitch with minimal shaping.